2012 Catan Resources Series Ornament 3 - Sheep/Wool Mayfair Games is pleased to offer the third in a 5 piece series of Catan Christmas ornaments. 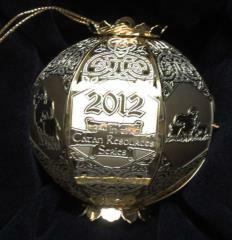 In 2012, the series kicked off with a beautiful, brass, globe-shaped ornament featuring the Mayfair Games and Catan logo, scenes from Catan during the production of wool, and the commemorative Series Mark. This third ornament features once again the Mayfair Games logo, Catan logo and scenes from Catan involving the production of sheep. Packaged in a deluxe presentation box, the 2012 Catan ornament is a stunning continuation in the series of ornaments that are sure to of interest to Catan fans and collectors everywhere.